What is Lone Star tennis? Lone Star Tennis is a USTA program where 2.5 level ladies’ teams compete in a local tournament event, with Spring winners advancing to state sectional competition. A team is made up of 6 to 12 players. Teams compete by playing 3 lines of doubles (no singles). Each doubles line is an 8-game pro set, no ad scoring. 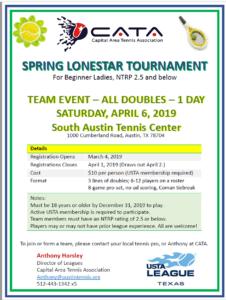 The team that wins the Spring Lone Star tournament in Austin earns a trip to Lone Star Sectionals where they will play with other teams from around Texas in a weekend of great fun, great tennis, and great prizes. Do I qualify to play Lone Star? Lone Star is for ladies rated 2.5 and below only. Players must be 18 years of age or older within the calendar year of play. When is the Spring Lone Star tournament? April 6, 2019 at South Austin Tennis Center start at 12 noon. Rescheduled to May 18th due to weather. Registration opens March 4, 2019. Team registration deadline date of March 31, 2019. Registration deadline extended to May 13th. Schedules will be sent out by April 2, 2019. Schedules out May 14, 2019. How do I sign up or form a team? It costs only $7/player registration fee + $3 online fee + the cost of joining USTA (if not already a USTA member). Speak to your local tennis pro about getting on a team. Get a group of ladies together and form your own team. Your local pro or Anthony Horsley [email protected] can help you get registered. Captains of current 2.5 teams can register like a normal league and use players from your current team.